Action Marine Park members are pictured at Marine Park, Lossiemouth, Moray. Action Marine Park has already been given permission to lease the popular green space in Lossiemouth from the council. Now the group has submitted plans to build a £250,000 pavilion there in order to make the park thrive once again. Included in the design of the two-storey building are a kitchen, stores for groups to keep equipment to be used and changing rooms as well as the option of a spectator balcony. Yesterday, group treasurer John Thomson said toilets were also being included in the proposals – and raised the possibility of them possibly being opened to members of the public amid current plans from the council to shut all conveniences across the region next year. He said: “It would be nice to think that we could provide that kind of thing so that’s something we’re going to take a closer look at later. “We’re trying to keep it very much as a blank canvas at the moment so if groups come to us later with a purpose then we could incorporate them. Action Marine Park was formed in 2011 with the intention of reviving the park to how they remembered it when they were young. Refurbishments have already improved the tennis courts and it is also regularly used for football. However, campaigners are eager to see the much-loved site used by even more groups in the future. 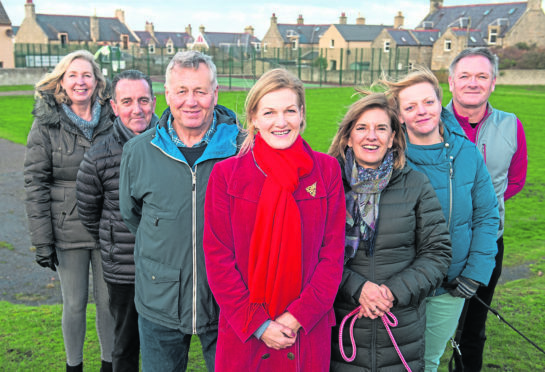 Lossiemouth Community Council has already run public toilets at Station Park in the town and it is eager to see as many loos preserved as possible in the area.